Forget world&apos;s smallest dog or tallest woman -- we&apos;ve found the truly bizarre world records. Who comes up with this stuff? 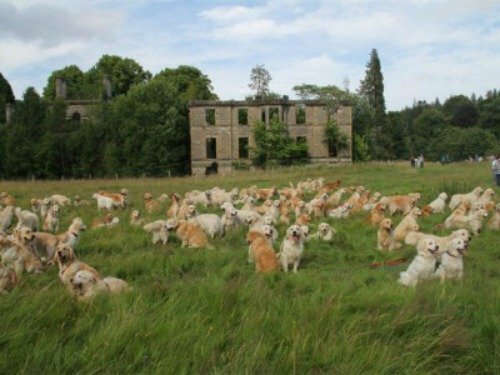 Last month the Golden Retriever Club of Scotland (yes, that&apos;s a thing) brought together a record-setting 222 Golden Retrievers at Guisachen House in Tomich, Invernessshire, where the breed originated. We don’t know why this happened, we’re just happy it did. Bettina Dorfman of Germany has been collecting Barbie Dolls since 1993 and reportedly has more than 15,000 different dolls in her collection. Maybe she’s the one buying all the Coach Barbies? After juggling 11 bean bags for 23 consecutive catches (which is known as a “qualifying run” in juggling record-setting jargon, because each item was caught at least twice) Alex Barron set a new Guinness World Record for the largest number of objects juggled. Barron also holds the record for most objects “flashed,” which means each item only needed to be caught once. And now you know more about juggling than you really need. Over the weekend, Fiji Airways invited a couple to tie the knot at 41,000 feet during a flight from Auckland to Nadi. The couple won a contest put on by the airline that allowed them to say their “I dos” in a cabin decked out for the event. Insert mile high club joke here. Michael Kopp of Hamburg, Germany, proved he has a lot of free time on his hands by managing to spin a basketball for 26 seconds on a toothbrush clenched between his teeth. But can he dunk? Were you obsessed with the Guiness Book of World Records as a kid?